Warm, buttery smooth roasted garlic makes a great spread for bread. Also amazing mixed in with pasta, potatoes, and much more. Place garlic bulbs in microwave for 20 seconds. Garlic bulbs will be hot. 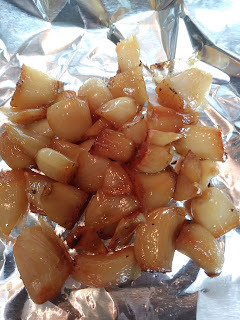 Remove from microwave, once cool remove garlic from skin, and place on a piece of tin foil. Lightly sprinkle with olive oil, raw unfiltered honey, salt, pepper and italian seasoning, gently toss to coat. Wrap tightly in foil. Bake 35 to 40 minutes, until soft. good idea and this can be used for so many uses! Such a great tip, I would add them too to my favorite potato soup. There's so many ways to use roasted garlic. I used them for homemade dressing! So many ways to use roasted garlic.